On May 10, an adult female Bald Eagle was found down on the ground in Richmond County. The bird was unable to fly and had blood coming from her mouth; she was captured and taken to a permitted wildlife rehabilitator. The following day, the eagle was transported to the Wildlife Center. Upon admission, the eagle was quiet but alert and was standing in her transport crate. The veterinary team examined the bird and found a laceration in the eagle’s mouth, as well as superficial lacerations on her face, legs, and feet. No fractures were palpated or visualized on radiographs, though the eagle’s right shoulder was mildly swollen. A lead test revealed a level of 0.058 ppm; at this low level, treatment wasn’t warranted. Additional blood work was within normal limits. The bird was treated with fluids and anti-inflammatories, and the team decided to move the eagle to a small outdoor enclosure for additional observation. The eagle did well in a C-pen enclosure in the two weeks following her admission; on May 31, the bird was moved into flight pen A3. The rehabilitation staff started a light exercise program on June 2; the bird is able to fly and uses both wings symmetrically. As of June 11, the eagle is flying an average of 10 passes in the enclosure; the rehabilitation staff will increase this to 15 passes as the bird’s stamina continues to improve. In the A3 space, the eagle is also serving as an adult role model for eaglet #18-1139; you can watch both birds on one of the Center’s Critter Cams! Your special donation will help the Center to provide care to this injured Bald Eagle … and all of the patients admitted in 2018. Please help! On July 4, 2018, Bald Eagle #18-0752 was successfully released at Rappahannock River Valley National Wildlife Refuge. A large crowd of more than 400 people joined President Ed Clark for the release. The bird was tossed into the air and flew to a nearby tree line, then out of sight. Lauren Cruz, the wildlife biologist at the refuge who initially rescued the eagle, was able to attend the release, as was VDGIF Executive Director Bob Duncan. Prior to release, this eagle was fitted with a GPS transmitter; the eagle will now be known as RR53 for tracking purposes. Check the Center’s Eagle Tracking page to see where the bird goes post-release! 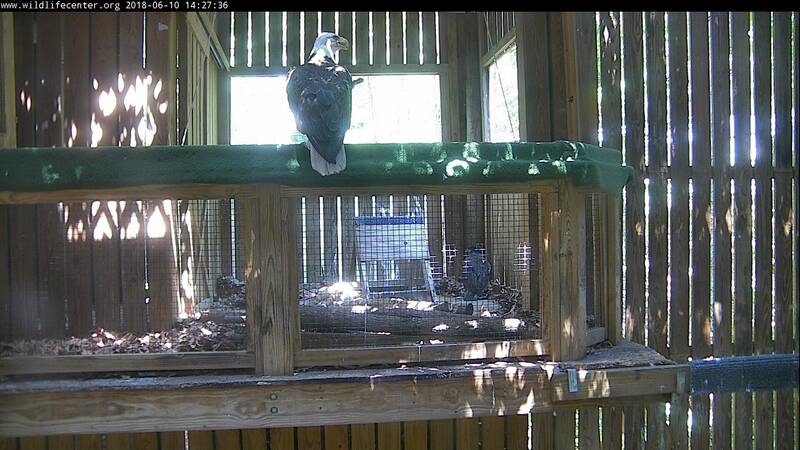 Bald Eagle #18-0752 has been flying well in flight pen A3. Earlier this week, the Wildlife Center staff began exploring release options in Richmond County, where the eagle was rescued. On July 3, pre-release blood work will be drawn for analysis; based on previous blood work, Dr. Ernesto expects the results to come back within normal limits. Also on July 3, eagle biologist Jeff Cooper will come to the Wildlife Center to fit a GPS transmitter on eagle #18-0752, which will track its movements after release. Wildlife Center President Ed Clark will release the Bald Eagle on Wednesday, July 4 at 11:00 a.m. at Wilna Pond in the Rappahannock River Valley Wildlife Refuge in Warsaw, Virginia [Click here for Google Map Location]. The release is free and open to the public; those attending are asked to RSVP to rsvp@wildlifecenter.org. The GPS transmitter will enable the bird to be part of an ongoing research study that will monitor eagle movements. This study looks at the data received from tracked Bald Eagles to determine the range and behavior of Bald Eagles in Virginia’s coastal plain. Migratory behavior is studied as biologists are able to see how far Bald Eagles move in the winter season, and the data will play an important role in modeling how these birds use airspace. By looking at heights at which the eagles fly, average distances, and other specifics, biologists are able to relate this eagle behavior to real-life issues, such as airstrike data. This is a fantastic opportunity for additional post-release studies of our rehabilitated raptors. As long as the transmitter is able to be fitted to the bird and transmits data successfully, the Wildlife Center will be able to see and share GPS data; the bird will then be added to the Eagle Tracking page on our website. Bald Eagle #18-0752 has been doing well during daily exercise during the past two weeks; the eagle typically flies about 10 passes in the A3 flight enclosure before tiring. The rehab staff recently set the exercise goal of 10-15 passes during each session, in hopes of continuing to improve the eagle’s stamina.